This article was printed from http://propel.mdat.org/2006/01/. Planning to go? Study hard! I would have gotten more cross-cultural training, especially focusing on the culture to which I was going. I wish I had known more about my relationship with God and about spiritual warfare. Language learning is a long process! My standard of living is drastically lower in a developing country. Their customs are not wrong, just different. In their language, is it what you imply with your words or what you say with your words what they hear? More nuts and bolts skills in: church planting, opening a business and obtaining visas in a creative access country, shipping of goods, obtaining housing and transportation during furlough, and so on. It is impossible to be completely prepared, but you can learn a lot before leaving on your assigment. A people’s or region’s history, their language and customs, their diet: In today’s internet age, all of this can be researched to some degree, even for a lot of unreached peoples. A lot of things are best learned by being immersed in the culture. The apostle Paul, for instance, while in Athens noticed an altar to an unknown god. He used that as a stepping stone for the Gospel among the Athenians. There will always be things that we can only learn by being a part of the culture – in particular among unreached peoples. That said, a good rule of thumb is to know as much as you can. As soon as you sense the nudge to go, begin to consider where you will serve: continent, region, country and right down to people group. Begin learning the region’s languages and customs. Read up on their history and politics. Cook their food and listen to their music. If possible, befriend someone from the region or people group, someone who might be a student or refugee. My wife and I have a heart for China. So, for Christmas, she asked for a book, a book intricately linked to Chinese culture. Not only was this translation difficult to find (the 5 part epic goes by three titles), it will likely be a thick read. Thus far, she is through the introduction, which is 40 pages in length. By no means can we know everything about China. But my wife’s book (The Story of the Stone by Cao Xueqin), the stir fry we cook and the Chinese movies we watch all prepare our hearts and minds for the opportunity to serve God among the Chinese. * See more at AskAMissionary.com. 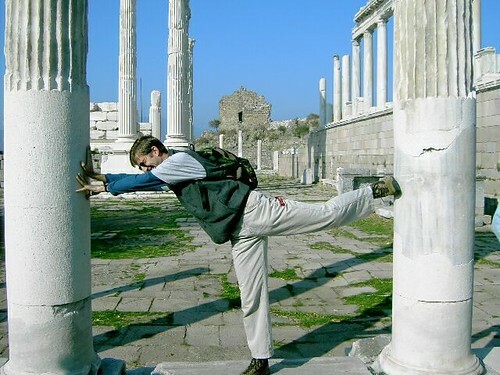 This issue features Erik (seen pushing over some ruins in Pergamum, Turkey). His experiences, with Operation Mobilisation, sailing round the Earth intrigued me. So I asked if he’d share a few more details of his involvement in missions for Propel. Propel: You spent 5 years on the Operation Mobilisation ship the Doulos, right? What prompted you to make your initial commitment to serve on the Doulos? Erik: Yes. For five and a half years. I was first challenged into missions at a seminar called Day of Discovery (Now NVision). After some curiosity into missions I read Unveiled at Last by Bob Sjogren. Very challenging. I was praying and looking for some way to be involved in missions. In February 1999, John Brown University held a missions week, and George Verwer was the speaker. He challenged each of us to go 2 years overseas in a missions capacity. I stood up. At that point, I didn’t know when or where or how, but I’d go. So after 6 months of prayer and prompting I officially applied. Five months after that I was onboard the Doulos. Propel: You’ve just come back to the states to serve in OM’s home office. What will your new responsibilities be? Erik: My specific role is heading up their Internships Program. We challenge students to take an academic internship overseas. We have 4,000 missionaries in 100 countries, so we can place anyone, with any background, with any set of skills or studies, and send them anywhere. We want to see these students have their world view changed, and enter into a missiological lifestyle. Whether they go long term overseas or work at home, they will be better equipped for life and be more involved in missions and their church. Propel: What was your field of study in college? How have you used that in your service with OM? Erik: Mechanical Engineering was my field of study. I was able to use it in the engine room of the Doulos. I worked as an Engine Rating for 10 months. Then because of my degree, and the school’s ABET accreditation, I was able to take an exam with the US Coast Guard and get my marine certificate. I served in that capacity for 14 months. Propel: What were the most difficult and the most rewarding aspects of teamwork in a mission context? Erik: Well, people are people. Different ways of working, different values. But Christians have Christ at the center so that makes it easier. But tensions do arise from time to time. Most rewarding? It’s fascinating to learn about each other’s cultures. I am a team person. I much prefer to do things as a team. We all bring different talents to the table. That’s what makes the Doulos amazing. 300 people from 40 nations working together. And the same is true in our office here. There is a lot of talent in that, and we can do some amazing things for God together. We are greater than the sum of the parts. Propel: In light of your missions service, is there another line of study or tidbit of knowledge you wish you had in order to be a better missionary? Erik: It would be nice to have more Bible Study, but that should never be something to stop a person from being a missionary. Propel: What have you found to be helpful in keeping your mission vision alive and growing? Erik: Listening to other missionaries and hearing their stories. That is probably my biggest motivation. Just the other day, I was able to listen to a missionary from Afghanistan – amazing! Propel: From your experience, what word of advice or encouragement would you offer to others on the journey of deepening mission involvement? Erik: For me it was a seminar, some books, a couple of short term mission trips. And then the Doulos and a lot of prayer. It’s one step at a time. Talk to missionaries. Go to seminars and mission conferences. For me, if I see and hear what God is doing, then I get excited and want to join in. Propel: Is there a passage of Scripture that keeps you going, keeps you involved in missions? God is at work in the world, and it is amazing to see. I played a small part on the Doulos which is only a part of OM, which is only a part of the missions movement, which is a part of the greater work of God.